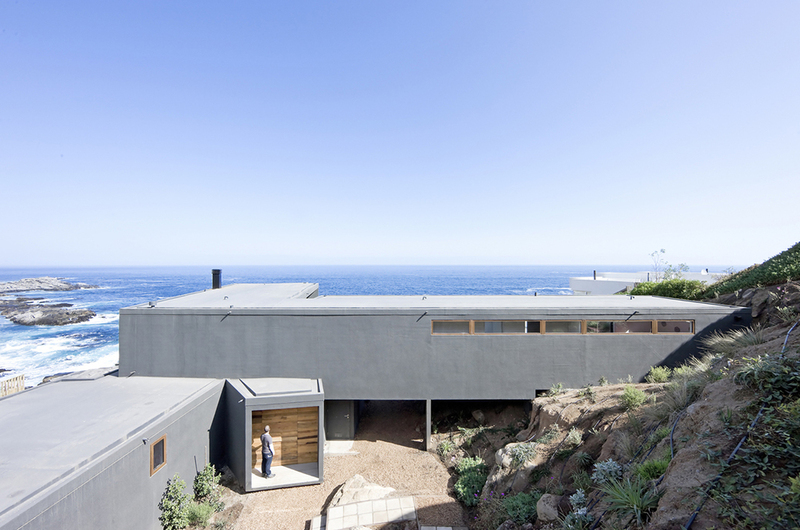 Snapshot: Chilean firm LAND Arquitectos’ Casa Atrapa Vista, built on coastal Chile, implements a design befitting a steep seaside slope and a magnificent seaside view. Casa Atrapa Vista is a structure that captures and frames the same existing view--by way of windows or architectural choices--in differing ways, ensuring a fresh take on the coastal scenery no matter where one is located on the property. The sweeping scenic panorama from Casa Atrapa Vista is viewable in its entirety from a magnificent driveway that joins masonry and cement patios into a symmetrical pattern. Take it in here, on this upper level, because LAND Arquitectos is going to re-run and re-cut the view numerous times inside and outside the house. Conceptualized as a sequence of varying frames of the same view organized around a strategy of leveling that befits the strong slope of the hillside on which it sits, the coastal Chilean “Catch The Views” House reorients the perception of the same magnificent coastal vista in, and around, its three-winged variously-elevated structure. The materials are coordinated to the existing coastline, particularly to the dark grey rocks, and are manufactured from weather-resistant components for increased durability against the harsh elements. LAND decreased its construction time by pre-fabricating the concrete panels and assembling them on site. These materials are used to build the rooms of the house, that each act as a gallery in which is housed one or two frames of the surrounding scenery. The rooms are separate but interconnected vessels arranged throughout the three wings and various levels of the house. Positioning rooms above or below each other and utilizing windows to great advantage accommodates the “framing” design goal, which manifests in nontraditional areas as well. Just watch the view progressively narrow and focus as one walks down from the patio into an interior courtyard formed from the L-shaped wings of the house gripping the rocky hillside, and which is decorated with tiles here and shrubbery there. The wing parallel to the coastline is elevated on stilts above the ground, eliciting the first framed view LAND has fabricated: the ocean and horizon is viewable through the boundaries created by the lower extremities of the house and the gravel below, and it’s a wide enough cavern to walk underneath. Doing so proffers the same vista as that offered by the patio/driveway, from a lower and closer viewpoint, a further re-cutting of the same original scene. The living areas are traditional efforts at framing the scene, its windows accenting rather than defining the allure of these main interior rooms. Other elements that give it are the color scheme of simple brown shades manifested throughout in the dark wooden flooring and transcending into the brown leather couch--itself offset by the white leather one perpendicular to it. The coffee table is thricely recessed, creating the same framing effect that defines the architectural method of Casa Atrapa Vista. The master bedroom interiorizes the leveling scheme by configuring a mezzanine-like den a few steps above the bedroom floor. It overlooks and helps form the headboard of a king size white bed sitting opposite another framed “picture” of the coastal scenery, this one extended quite three dimensionally by wrapping the window 45 degrees around the periphery of the room while a balconied exterior adds enjoyment and increased perceptual pleasure. A sea chest lies at the bed’s foot, accentuating the coastal tone. LAND Arquitectos utilizes the unique geography of coastal Chile for its design choices while also designing a home that compliments that beautiful scenery, in which it is placed. It ensures, quite well, that both interior and exterior holds something in the manner of perceptual viewing pleasure, cutting and splicing the same scene in a way that keeps it fresh no matter where you find yourself on this property.